When you’re expecting a new addition to your family, there are a million and one decisions to make. The most fun ones of all involve creating a nursery that represents your style, of course. 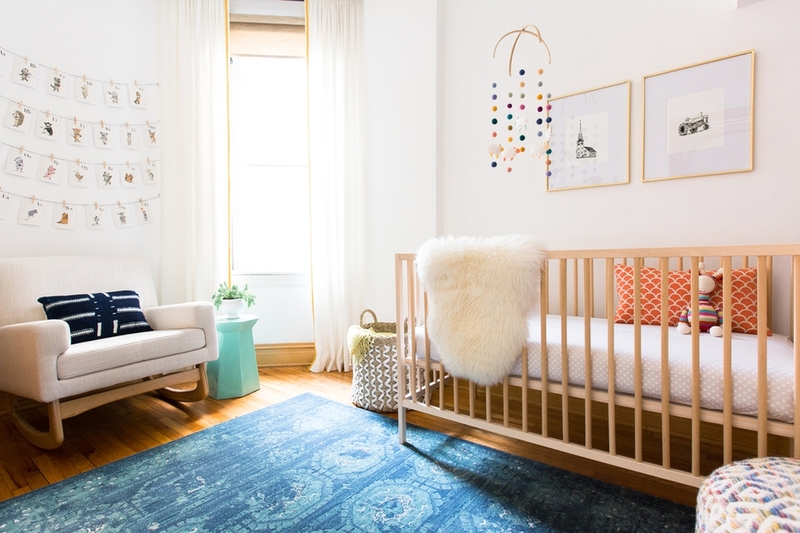 Yet, even those who live and breathe all things design can get quickly overwhelmed by the sheer number of options out there for nurseries, especially if you’re gravitating towards a gender-neutral design. While it used to be that a gender-neutral design was centered around the color yellow, today’s nurseries reflect the growing shift away from defining “pink” and “blue” as strictly for girls or boys. We’ve rounded up five creative ideas that could work for any baby—and can even grow with them. This modern nursery by Ore Studios was designed to go with the overall color scheme of the rest of the home, a harmonious blend of beiges and browns. Though many might initially blanch at the idea of a beige nursery, the effect is actually soothing. Layering in white and light wood also helps keep the look from getting too dark. Light wood finishes also lend modern appeal to this Scandinavian-inspired nursery by mother-and-daughter design team Diane Schmunk and Emily Barry of Rehabitat Interiors. The fresh white walls, upholstery, and drapes maximize light even further and enhance the bold colors incorporated through accessories. Minimalists will love Decorist Elite designer Stefani Stein’s take on the modern nursery. Like the Rehabitat Design, it’s a pairing of light wood and white—but instead of layering in bold accessories, Stefani relied on the simple beauty of a leafy potted tree to bring in a little color. Created by husband-and-wife duo Griffin and Stephanie McCabe of Akin Design, this nursery takes a natural theme in a new direction. 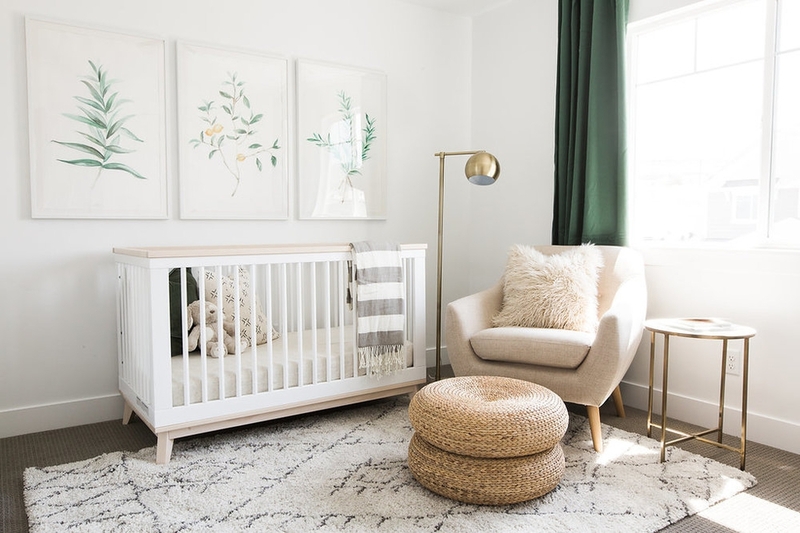 Inspired by the leafy wall prints, the nursery incorporates rich green drapes to play off the layers of beige, white, and little touches of rattan and light wood in the rest of the space. Though we believe that flowers can work for boys or girls, opting for botanical influences feels like a more gender-neutral approach at first glance. 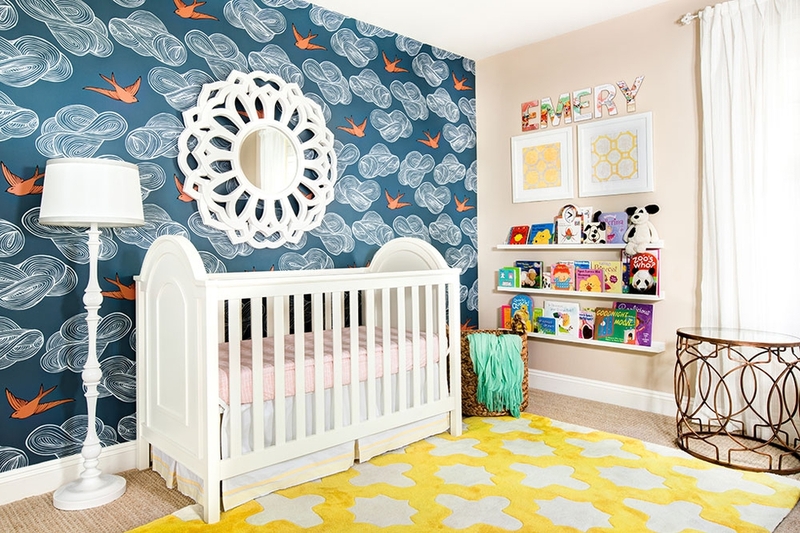 There is room for bold color in the gender-neutral nursery, along with even bolder patterns. This space by J and J Design Group is anchored by bird-themed wallpaper in a dazzling dark blue and orange, which holds its own against the plush patterned lemon yellow rug. Though you could pick up the blue from the wallpaper with the other walls in the room, beige gives a space for the eye to rest. Need some help decorating a nursery or kids room in your own home? Start a project with a Decorist designer today!